Father Raymond J. de Souza was ordained a Catholic priest on 20th July 2002 for the Archdiocese of Kingston, Ontario. He currently serves as Chaplain at Newman House, the Roman Catholic chaplaincy at Queen’s University. He is also the Pastor of Sacred Heart of Mary Parish on Wolfe Island – the largest of the Thousand Islands – where he lives. A frequent guest preacher and speaker, Father de Souza also teaches at Queen’s in the Faculty of Education and the Queen’s Economics Department. Also at Queen’s, he serves as chaplain for the Queen’s University football team, Vanier Cup national champions in 2009. 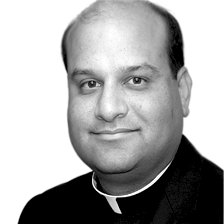 Father de Souza was born on 17th June 1971 in Sarnia, Ontario. His father worked in the oil business and the family was subsequently transferred to Calgary, Alberta. He completed all elementary and secondary schooling in Calgary, graduating from Bishop Carroll High School in 1989. He was awarded the Governor General’s Medal for the top academic standing in his graduating class. Enrolling in Queen’s University at Kingston in the fall of 1989, Father de Souza was active in campus politics and student government. He graduated in 1993 with a Bachelor of Arts (Honours) in Economics and Politics. Pursuing his interest in public policy, he continued at Queen’s in the School of Policy Studies, completing a Master in Public Administration in 1994. While at Queen’s University, Father de Souza was awarded several scholarships – including the Norman Rogers Scholarship for the graduate with the most promising future in public service. During his time at Queen’s, Father de Souza was a parishioner at St. Mary’s Cathedral. In 1995, Father de Souza was awarded a Rotary Foundation Ambassadorial Scholarship which he used to study questions of economic development in the Philippines. He was appointed an Economic Research Fellow in the School of Economics at the University of Asia and the Pacific (Manila). Subsequently, Father de Souza studied development economics more formally, completing in 1996 a M. Phil. in Development Studies at the University of Cambridge (England). While at Cambridge, he was a member of Pembroke College and was active in the St. John Fisher House Catholic Chaplaincy. Father de Souza entered the seminary in the fall of 1996, beginning a two-year course in philosophy at St. Philip’s Seminary at the Toronto Oratory of St. Philip Neri. In August 1998, having graduated with a Bachelor of Thomistic Thought, he was sent by Archbishop Francis J. Spence of Kingston to the Pontifical North American College in Rome for his theological studies. In 2001 he completed the Bachelor of Sacred Theology at the Pontifical Gregorian University. He was assigned by Archbishop Anthony G. Meagher of Kingston to complete the Licentiate in Sacred Theology at the Pontifical University of the Holy Cross, which he did in June 2003. His area of specialization is Catholic social teaching. Described by papal biographer George Weigel as “Canada’s finest Catholic commentator,”1 Father de Souza writes for a number of publications. Principal among these is the National Post, where he is a weekly columnist. He also contributes to the National Catholic Register, a leading American Catholic weekly, where he served as the Rome Correspondent for five years, including extensive coverage of the Jubilee Year of 2000. For over ten years he has written a monthly commentary on the writings of Pope John Paul II and Pope Benedict XVI for the The Messenger of Saint Anthony (International English edition). He served from 2006 to 2009 as the editor of Religion & Liberty, published by the Acton Institute for the Study of Religion and Liberty. Father de Souza also sits on the national board of directors of the Canada-Israel Committee, serves at a media consultant to the Ontario Conference of Catholic Bishops, and media advisor to the Pontifical Academy of Social Sciences at the Holy See. Father de Souza’s parents – married for 44 years – still live in Calgary. He has one older brother and two younger sisters.